Carbon fibre reinforced plastic is increasingly used in the aerospace and the automotive industry for its strength-to-weight ratio, achieved by the very high resistance of carbon fibres. The fibres need to be exactly aligned to fit the strength needed on specific parts, and a deviation of only 5° may reduce the strength by 40%. Such sensitivity can lead to excessive safety factors, lowering the expected benefits. More accurate and automatic measurement systems are needed, and could also enable automated production processes. 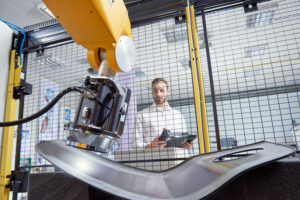 Innovation: Profactor, EARTO member through UAR, developed along with its partners an innovative sensor system combined with a robotic arm for automatically measuring fibre orientation on the whole surface of carbon fibre parts of complex geometry. The patented sensor’s high speed allows automatic scanning with up to 1m/s, which is quick enough to enable industrial applicati ons of inline quality control in the automotive and aerospace industry. Impact expected: With this technology, industry can save ~€400k within three years after the implementation of the technology. On an Airbus A350, the improved production processes would allow a 20% reduction in weight, which in turn would save 64k tons of CO2 per year per plane. First implementations of the robotic measurements in the aerospace have already been made within 1 year after the end of the R&D project. Profactor is an applied research company with headquarters in Steyr and Vienna. PROFACTOR acts as an interface between science and business.